The ITVS Open Call deadline is only five days away, making it the perfect time to read the next installment of our ‘work –in-progress’ series. Submitting an enticing ‘work-in-progress’ can be difficult, even for the veteran filmmaker. Today, we bring you As Goes Janesville’s Brad Lichtenstein, who despite having vast filmmaking experience, had to learn how to wrangle five main characters in his sample before being successfully funded. 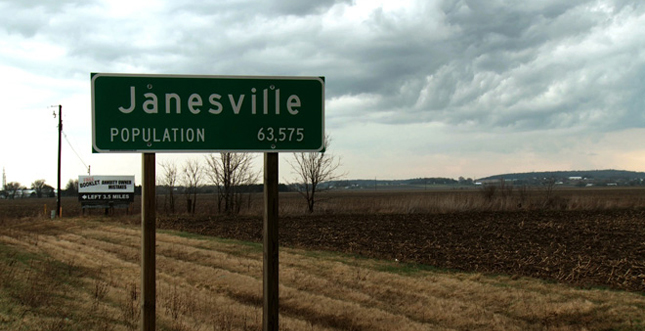 Description: From the day the GM factory closes through a showdown with national resonance at the state capitol, As Goes Janesville traces the impact of the economic crisis on the people of Janesville, Wisconsin. Brad Lichtenstein: I got some really good feedback about the work-in-progress, which ultimately turned into the way the actual film starts, and that is start with an 80-second tease. And that 80-second tease serves as two things: first, it’s a dumb show, which is a device that comes from theater. Sometimes the players would do the whole play in about 30 seconds and then present the whole play. It was just a way for your audience to get a little settled. If you’re really going to show them a complicated story, make a really simple version of it first and then show them the complicated version. Secondly, it was a very efficient way to alert you to who the main characters were so that you don’t have to rush to get everyone on stage and introduce them one after the other. Instead you bring them on stage when there’s a dramatic reason to bring them on stage. You need to get right to what’s at stake. We saved all of the complicating dramatic plot devices until the end so you left wanting more. You find out that there’s this car accident, you find out that Gayle’s kids are crying and upset without her, and you find out that Cindy might have breast cancer. I wanted to make sure that the ending was strong because I felt like we really needed to leave the reviewers with a strong sense of the possibilities of the film. Honestly, I was trying to milk that material to really set up the personal stakes for our characters. But cutting the work-in-progress that way was necessary, too, because I really didn’t have the middle and the end of the story yet. Yet, I was very conscious from a strategic standpoint that I needed to get the audience really invested in these characters. Another thing, in cutting this material, is that I was extremely conscious of my targeted audience at ITVS for this work-in-progress. I know that the people watching it are going to be primarily filmmakers or people who work at ITVS. It’s a tough crowd. I know that there’s a couple of things they’ll want to know from a work-in-progress, like that I can demonstrate that I can weave the characters and will be weaving more over the course of the full edit. I remember we really labored over this. Initially, we weren’t successful the first time around because we had no weave at all. We just presented our characters and I didn’t know any way around that because I didn’t have the resources to really spend the time to weave. That’s exactly why I decided to spend some of the company’s money that wasn’t project-raised money to bring in Leslie Simmer at Kartemquin to really try to figure out how to weave the material that we had together. I never want to do what people do with power point all the time, which is that they have this visual aid and all they do with it is put a bunch of the same words that you’re saying onto the screen and call it a presentation. I always want to think about the dynamic relationship between the work-in-progress and the treatment. I try to balance that out so you’re not feeling like the work-in-progress is just some kind of visualization of what you read, except to the extent that it proves how what you just read is going to translate to the screen. I really think of the treatment as my rendering dramatically and substantively, in terms of characters and of story. And the work-in-progress is the proof that we can tell it in this medium, which is film. I always felt from my own experience on panels, that the work-in-progress has the potential to sway the panel more than anything that’s written. At a certain point, everybody’s film proposal starts to sound the same. But the most substantive thing in the proposal is your work-in-progress. I can remember at least two of the projects on the panel that I was on: one where the work-in-progress completely persuaded the panel not to fund it and the other where the work-in-progress got us to fund it. The first was high on the list and ended up not getting anything and the other was not even in the mix based on the writing. The work-in-progress pushed the project toward the top. Another thing I knew about being on panels is that there’s a tendency that if it feels unfinished then it opens up discussion or doubt about the panel’s confidence level in the filmmaker and whether or not she can pull it off. Even though I don’t like my temp music that much any more, I really remember that we spent a lot of time working with music and making the work-in-progress feel more polished. I try to really visualize the people who are going to be reviewing this and as much as everybody wants to bring a fresh spirit to every single proposal they have to look at, I know what this process is like. At some point you’re calculating “I need to get 15 more proposals reviewed by the end of the day, otherwise I’m going to be really behind and the deadline is next Wednesday.” You know, we’re people and we have real deadlines and real pressures. So I try to think about how when I was reviewing, I went from “show me” to “prove yourself.” If you think about it in a concrete kind of way, then I think it motivates you to make sure you’re putting as much effort and thought into the work-in-progress that you would into the full film. Take some risks. Especially now because the competition is so keen, the numbers have risen so much in terms of the number of applicants. It really is worth spending the resources and the time to make the work-in-progress really sing the song of your film, not just be a sketch. I must have spent $8,000 I didn’t have in order to complete mine but it is a risk/reward assessment that I made. And there’s not really a higher risk/reward ratio than ITVS, MacArthur, or Ford. There’s not many places that are going to afford you an opportunity to get six-figure support for your project. And to me it’s worth the risk/reward by having your star editor, in this case Leslie Simmer. It is going to make a big difference. Or giving yourself three extra weeks, which will also make the difference. That’s just real world filmmaking. It’s about making choices when it comes to resources. A small number of projects get funded, so it’s still pretty chancy. The other thing is that now you have that really good piece to go around and use for seeking funding from other sources. So it was definitely an investment that paid off.